In a scene from the short-lived CW show Emily Owens, M.D., the title character is introduced to a coworker from Wisconsin. Dr. Owens admonishes herself, through a voice-over: “Do not mention cheese!” Being a character in a mediocre sitcom, she of course blurts out something about cheese anyway. What is out-of-staters’ number one answer to that question? “Cheese.” (The erstwhile Dr. Owens was apparently not an outlier.) That’s fine, insofar as cheese is a popular food. But — take it from someone who has spent a lot of time in other states — the rest of the country is not all that impressed by our ability to churn the stuff out in massive amounts. Under normal circumstances, I would fall firmly into the “who cares what they think of us?” camp on this. But Wisconsin is on the verge of a net migration crisis. In the economy of the next few decades, merely holding on to Wisconsin natives will not suffice. We need lots of people, especially younger people, to start moving to our fair state permanently (and not just to Madison). Kurt Bauer, president and CEO of Wisconsin Manufacturers & Commerce, agrees that current projections are daunting. “The consequences are economic stagnation at best and contraction at worse. Even if we build a wall around the state to keep everyone here from leaving, Wisconsin will still have a workforce shortage unless we can attract people from outside the state to come in.” Reached by email, Bauer adds that 77 percent of his organization’s members already say they can’t find workers. That figure has been rising steadily, he says, due in part to the aging of the state’s workforce. So what keeps newcomers away? Some say it’s the cold, though if anything it’s a little warmer here than it was in the 1990s, when Wisconsin was stealing residents from all over the country. Some blame the Republican leadership of state government, though many of the GOP’s purported sins have curbed our tax burden, which tends to attract new residents. While there is probably no single answer, surely nothing has dulled our national image as much as those goofy foam cheeseheads. Those whose knowledge of Wisconsin’s culture is derived from the media — that is, most of the country — might assume we’re required to don them whenever and wherever we congregate. This fashion choice must be terribly confusing to outsiders, especially younger ones. 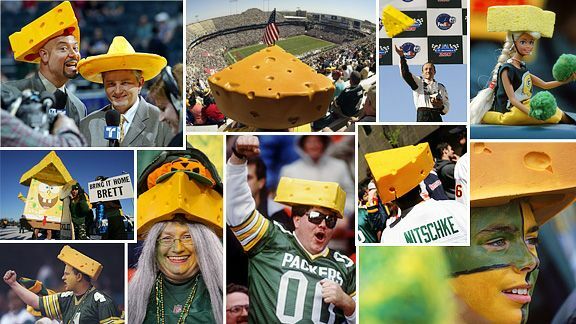 Chances are they do not know that the yellowish headpieces started life as a symbol of defiance, an embrace of the Chicago-born “cheesehead” insult. Anyway, new-economy millennials care as little about ancient cross-border rivalries as they do which state manufactures their nachos sauce. As former longtime president of WMC Foundation, Jim Morgan oversaw that organization’s Future Wisconsin project, which asked the “what comes to mind” questions cited above. Morgan, now working on the talent issue at MRA in Waukesha, has no doubt that image matters in the competition between states to attract well-educated long-term residents. “We have to imagine the talented kid waking up in South Carolina, trying to decide between Portland, Austin, and Wisconsin.” Where that kid lands will, in large part, define his future identity. Indeed, Wisconsin is flush with pride points. Jim Morgan is right about the impressive tech startup scene, centered especially in Madison and downtown Eau Claire, and the UW system, with its still-intact “sifting and winnowing” motto. PHOX, Bon Iver, and the Justin Vernon-founded Eaux Claires Music Festival have put Central Wisconsin on the radar of hip audiophiles the world over. We are blessed with an inordinate number of mid-sized cities, which millennials love. And the Green Bay Packers — who literally belong to fans across the whole state — are the most consistently exciting team in the NFL. We’ll stay proud of our cheese, too. But we have a serious challenge on the horizon. Meeting it will require a new calling card. Wisconsin does an OK job attracting people from next door ie Chicago but it's just too cold for people outside of the state to seriously want to move here without a large (monetary) incentive. There are a few places that pay well (very well) like Epic systems come to mind, but otherwise it's simply too cold here and although most Wisconsinites reading this would say that it's "not too cold here" and "what about (fill in blank good thing about Wisconsin here)" or the ever popular "I like the cold, it's cozy"; most Americans don't see it that way. The reality is that Wisconsin will never attract many people due to the harsh climate, the best chance for Wisconsin to grow is au natural, we need more incentives for couples, especially young ones saddled with student loan debt to have children. Don't kid yourself we aren't going to steal other states children we have to make them ourselves. period. And don't forget that our nation's most powerful supercomputers are designed in part and manufactured in Wisconsin (by world supercomputing leader, Cray Inc, in Chippewa Falls). These systems are indispensable tools for weather forecasting, scientific discovery, national security, and industrial design.